Red Lobster is my favorite place to eat. Everytime I go I always try to get something new. 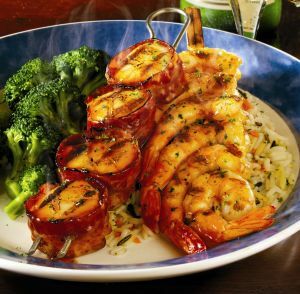 So this time after eating 54 Cheddar Bay Biscuits, and the always good house salad, I tried the Peach Bourbon BBQ Shrimp and Scallops at the Red Lobster in Peoria AZ. DELICIOUS. Now, this entree comes with crispy onion rings, in the picture here it shows rice, I didn't take a picture of my own plate, was too hungry to waste time with pictures, and I hate onions more than anything else that exists, so I replaced the onion rings with the mashed potatoes. Which seemed like it would be a better choice to begin with. I'm a big BBQ fan, so any time I find a new BBQ sauce that hits the spot makes my day. Its got a tiny kick to it with the spice but isn't too spicy that it takes away the rest of the flavor. And unlike most BBQ sauces that have some type of fruit or other flavor on it, you can actually taste the peach in this sauce. Its one of the best BBQ sauces I've tasted. The scallops come with bacon wrapped around them, and I'm not a huge fan of that. Not big on scallops but I hoped the BBQ might help it, it didn't too much. And the bacon wasn't fully cooked so I just tossed it to the side. The shrimp was amazing of course. This has become my favorite item on the menu at Red Lobster. Next time I get this I will probably take out the scallops and ask for two sticks of the shrimp. And more Cheddar Bay Biscuits of course. One of my favorite things about Red Lobster is indeed the salad. Not only is it great, but just about every time I've been, it's on the table within 2 minutes of making your order. My husband is NOT a seafood eater...he is beyond indifferent to it. However we frequent this place because I LOVE seafood and few places do it better or as good. This is the ONLY dish he goes there for. That's how I know it's good! He would rather eat biscuits the entire meal and grab a burger on the way home than to have anything else other than this dish!